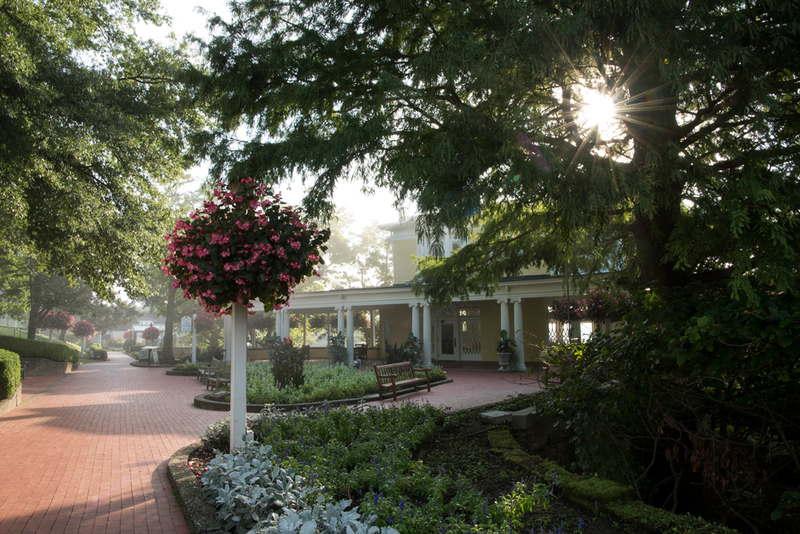 Playing golf at Oglebay Resort is like stepping into the past, yet remaining firmly planted in the present. We’ve always felt a special attraction to this wonderful resort, tucked into 1,700 hilly acres just northeast of Wheeling, W. Va., about a two-hour drive from Columbus. 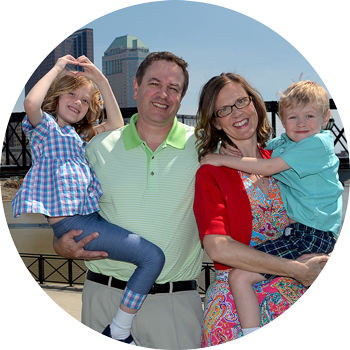 After all, Wendy and I held our wedding reception at Oglebay in April 2005. 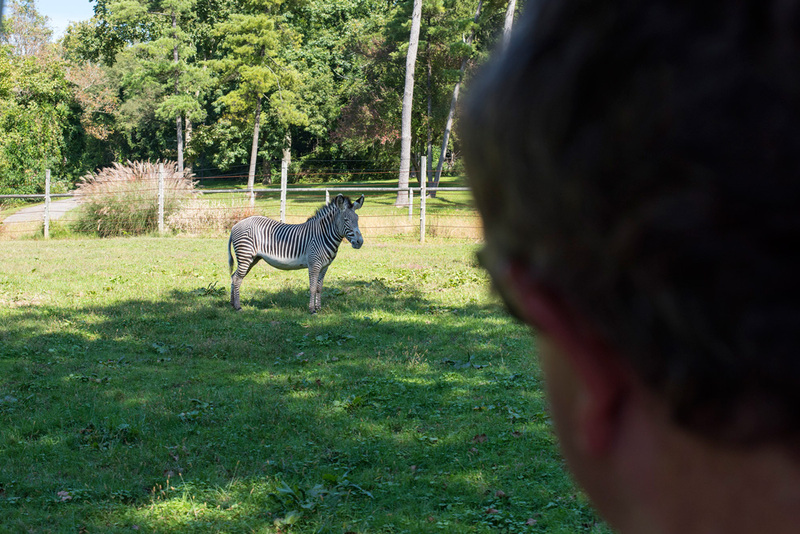 We try to return at least once a year, and this time we visited during early October so I could play golf and Wendy and the kids could explore the resort. 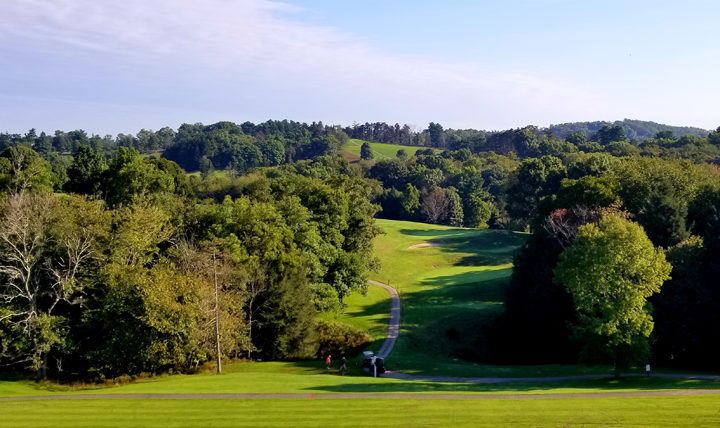 Golfing at Oglebay presents an excellent opportunity to enjoy the vistas of the Appalachian landscape. 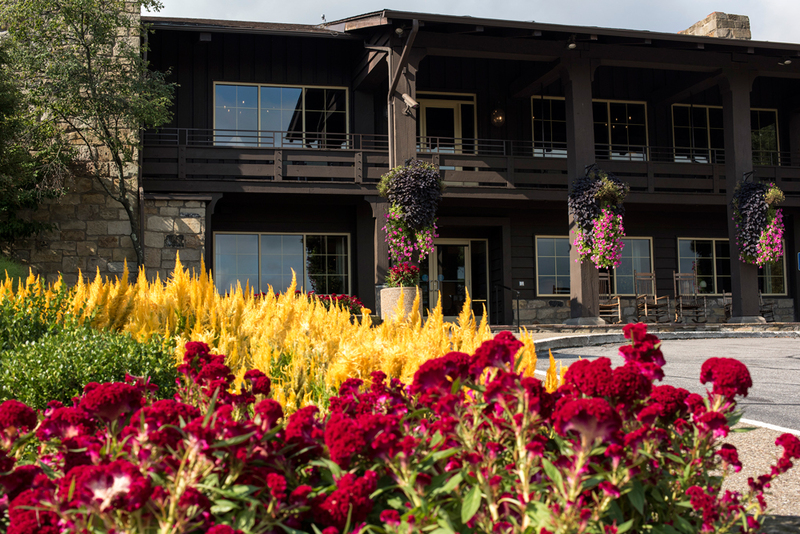 The resort offers four courses – the two main layouts called Jones and Palmer, the classic Crispin course and a nine-hole, par-3 layout that’s perfect for youngsters. They combine the new and the old, which is always what I liked about Oglebay. This is no modernized golf mecca. Crispin dates to the 1930s. There were no bulldozers employed to sculpt out the course. It simply followed the contours of the land, so you have some very abrupt elevation changes. Lovely Appalachian terrain is on full view at Oglebay. It was joined in 1970 by the Jones Course, which legendary architect Robert Trent Jones, Sr. built in a somewhat similar manner, although much better. Most of the fairways on Jones have some contour, and the drainage rolls with the slope of the terrain. The Palmer Course rounded out the package in 2000 and best reflects modern golf course design, as much dirt was moved to create a more playable layout. 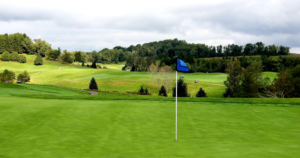 The Jones Course and the Palmer Course comprise the Speidel Golf Club, and growing up in eastern Ohio, I’ve always considered Speidel a true test of the game. Not only for me – for professional golfers as well. The Jones Course was a regular stop on the LPGA tour from 1974-84, its hilly terrain often causing havoc for some of the best golfers in the world. It was a fairly new course then, and Jones’s design takes advantage of the mountainous terrain. It offers several elevation changes, plenty of side-hill lies, lots of trees, and small, contoured greens. The routing follows the land, and you’re likely to find yourself punching out of a grove of trees into a fairway if your drive is a bit off center. Oglebay commissioned Arnold Palmer’s golf architecture firm to build the Palmer Course to make Oglebay more of a resort destination. Earl W. Oglebay willed his mansion to the city of Wheeling after his death in 1926. One of the main attractions is the former summer estate of the late industrialist Earl W. Oglebay. 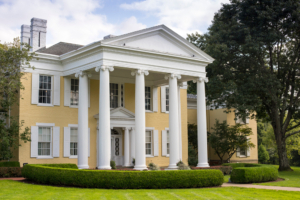 The yellow mansion with stately white pillars is a museum that’s a tribute to Oglebay and the history of the property. The resort is a great place for families. There are plenty of things to do, and they’re often rather quaint in their simplicity. Take the Good Zoo. Opened in 1977 in a wooded area, it contains African wild dogs, meerkats, kangaroos, lorikeets and other animals, as well as a dinosaur exhibit with animatronic creatures. 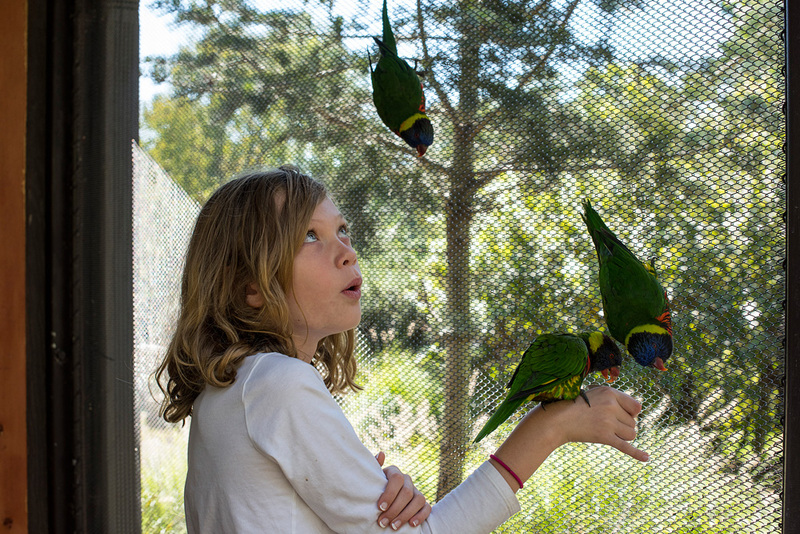 The lorikeets are particularly friendly if you entice them with nectar that the zoo sells for $1 a cup. Several of the colorful birds were perched on Rosie and Max as they tried to grasp a taste of the sweet liquid. 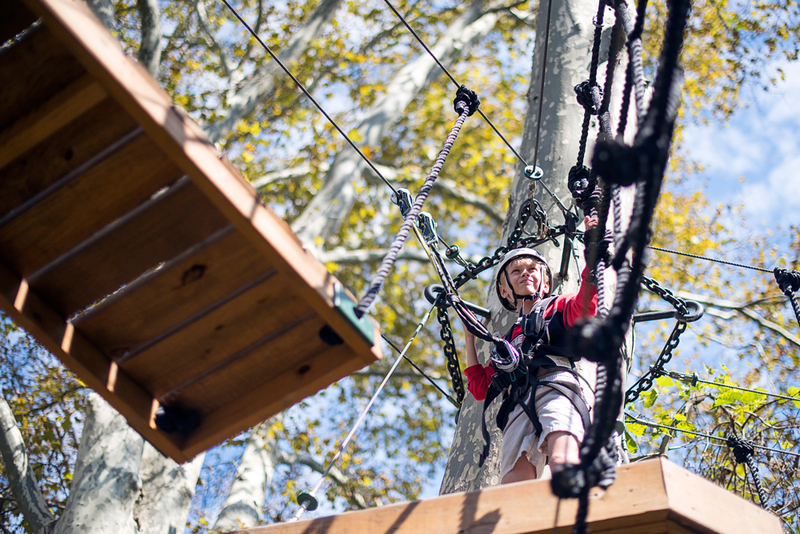 Max maneuvers around the Oglebay Aerial Challenge Course. We took a mile-and-a-half ride aboard the C.P. Huntington train, an open-air recreation of a 19th century locomotive. It moved rather slowly, and to our amusement required the conductors to stop the train, get out and disperse sand on the tracks so the wheels could grip well enough to propel the train up a couple of mild inclines. 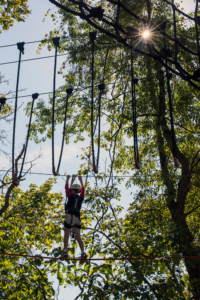 We had fun riding paddleboats around Schenk Lake, and Max had a blast on the Oglebay Aerial Challenge Course, a combination of rope walks, climbs and maneuvers high above the ground. Max spent an hour exploring the course, while safely tethered, with one of the friendly guides. 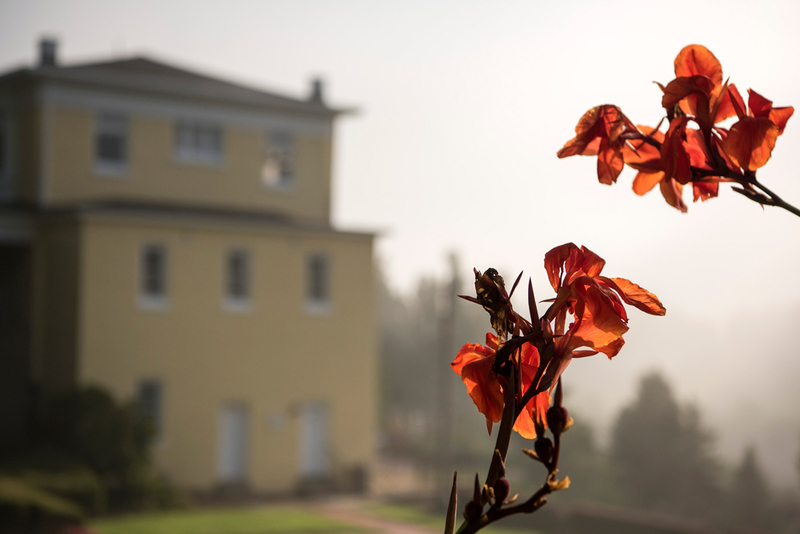 We also love exploring the surrounding landscape, so thoughtfully cared for and manicured. 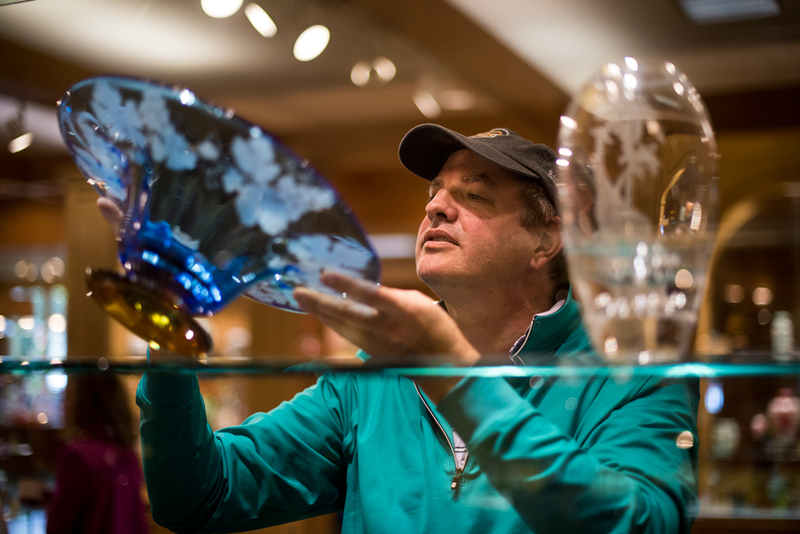 Visitors also can tour a glass museum and wander along a red brick path through a garden that dates back a century. Oglebay also offers quality horseback riding opportunities, being the home of the nearby Bethany College equestrian team. You also can play tennis, ride a mountain bike or discover one of the walking and hiking trails. Oglebay’s Crispin Center hasn’t changed much since opening in the late 1930s. Built of locally-quarried sandstone, it’s elegant alongside the sky-blue pool. It’s closed now, but when the weather warms it’s a lovely place to take a dip. We stayed two nights in a newly remodeled, lakeside room at Wilson Lodge, which has 270 rooms. The accommodation was comfortable and quiet, and we easily accessed the indoor pool, outdoor patios, Ihlenfeld Dining Room and wonderful upstairs sitting area. Wintertime it’s a poplar site for the Winter Festival of Lights, a six-mile drive showcasing millions of twinkling lights on more than 300 hilly acres. I played the Palmer Course with two of my childhood buddies on a brisk October Saturday. The first thing you notice about this course is the lack of trees along many of the holes. The fairways are a bit wider, too, and there are multiple tee boxes that can allow you to play according to your handicap. You get the feeling that Oglebay tried to wedge the course in where it had room. There are six each par-3s, par-4s and par-5s, which certainly is unique, and you play three holes then drive quite a distance under a road to get to most of the rest of the course. We found it well-conditioned and very playable. There are five set of tees, ranging from 4,569 yards to 6,725 yards. The men’s tees (second longest) measure 6,498 with a slope of 130 and a rating of 70.9. The comparable measurables for the Jones Course are 6,650, 134 and 72.5. Having played the Jones Course multiple times, I can attest that it is tighter and can be more difficult. We’ve played it since our teens and prefer it to the Palmer Course. Crispin is fun if you want to give it a try. It is shorter, but bring your climbing shoes. The elevation changes are stark. Oglebay offers golf packages from late March to early November. Call 800-577-9519 or visit Oglebay.com for more information.